← Welcome to Yesterday’s Thimble! 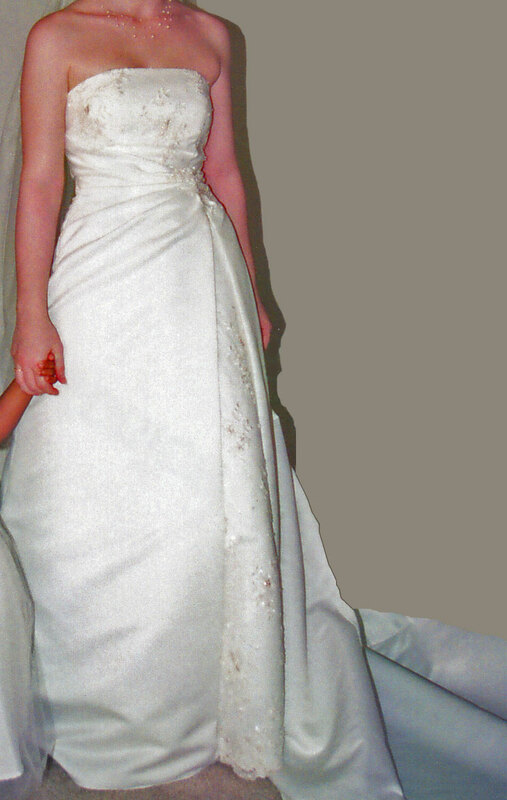 A long time ago I had the idea to make and sell doll-sized replicas of wedding gowns, creating fashion dolls that resemble the bride. The idea never panned out, but I always wanted to try it just once, using my own wedding gown as the inspiration. 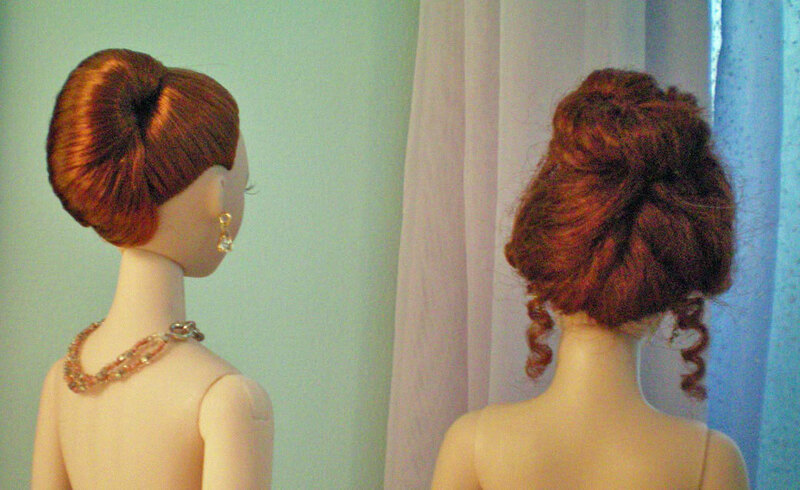 Last year, my grandmother gave me a red-headed Gene® doll—a vinyl fashion doll similar to Barbie® but much larger. Her hair is auburn, pulled back into a tight French twist. I have another doll of the same size: Rose from the film Titanic. Her features aren’t as delicate as Gene’s, but she has dark red hair that can be put up with tiny hairpins. Gene is styled as a 1940s actress, with a large chest and tiny wasp waist, while Rose has the figure of a corseted woman from around 1912—a higher, smaller bust, and a smooth line from chest to hip. Either of these two would work as the doll for my bridal replica, since I have auburn hair and green eyes. While I prefer the features of the Gene doll, the Rose doll’s hair can be styled much easier, and her body shape is closer to mine. The problem? She has curly bangs and ringlets, which I do not. Her makeup is rather severe, but that can always be enhanced using acrylic paints. So, I can either make do with what I have, and end up with a doll whose hair is not exact, or I can wait until I can afford to purchase a different doll—something with a hairstyle that’s closer to what I wore at my wedding. My wedding gown is a simple strapless A-line with a chapel train, but it has some lovely design features. It’s made of matte satin, in an eggshell ivory. The front splits on one side, revealing an underskirt covered with exquisitely embroidered lace. The empire bodice is likewise covered in this lace, with an over-bodice of pleated satin. 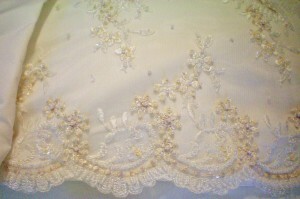 The embroidery on the lace contains a pinkish-beige thread, tiny iridescent sequins, and pearls. With the gown, I wore an illusion necklace of pale pink and ivory pearls, and a tiara hand-embellished with rhinestones, pearls, and transparent pink-champagne beads. My veil is custom made of shimmering ivory tulle, with the edges embroidered to match the lace of the gown. For dolls, it’s important that the fabric be scaled appropriately, so instead of using heavy bridal satin, I plan to use a lightweight off-white sateen. 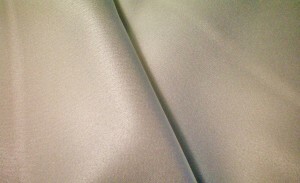 It gives the effect of matte satin, but in a suitable thickness for the doll’s size. I’ve been unable to find a suitable lace to use, but I do have plenty of shimmering tulle leftover from the wedding. 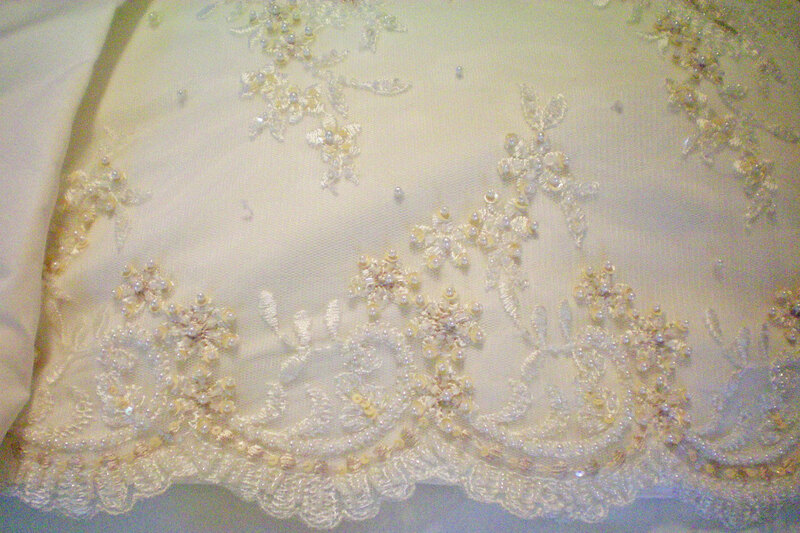 I plan to hand embroider and bead it to imitate the lace of the wedding gown, using the leftover beads and pearls that I bought to embellish the veil. I will twist a miniature tiara out of silver or gold wire, and I will create a miniature pearl necklace to match the one I wore. What do you think? Should I move this to the top of my “to-do” list, or should I continue to postpone it? Should I use Rose or Gene—or hold out for something better? This entry was posted in Sunday's Someday Projects and tagged Dolls, Modern Garments, Replica, Sunday. Bookmark the permalink. A were right about the eggshell coloring of your wedding dress. Don’t know why I even thought to doubt that it was the right color. Maybe because it looks more white in the wedding photos? Up close, it’s definitely eggshell, though. Ah, okay. No problem, and thanks. I think this is a fantastic project and I think if you can, go for it sooner rather than later! I’ll definitely consider it, then. Thanks!